Gatecrash features 249 black-bordered cards, including randomly inserted premium versions of all cards in the set. Gatecrash is available in booster packs, intro packs, and fat packs. While all Magic sets are designed to function both as a resource for Constructed format deck-building and Limited format play, it’s tough for a set to hit both targets accurately at the same time. Gatecrash, while fun in a Limited (draft, sealed) environment, is far more suited as a resource for building and rounding out your Standard and Modern decks. The five-guild structure of the set forces five very distinct primary archetypes when building with only Gatecrash cards. In a Limited format, where you have access only to the cards in the specifically selected set(s), this tends to reduce flexibility in play styles. This narrowing of strategies is further amplified when you have a maximum number of cards you have access to, and are restricted to a relatively random subset of Gatecrash cards. In simpler terms, Gatecrash wants to be played specific ways, and does the job less effectively when you can’t be as selective in choosing the cards to make those specific strategies work. The five strategies presented all have the potential to work in Sealed or Draft scenarios, but are notably weakened if key cards specific to each of those strategies are unavailable to you. And, as noted earlier, the set doesn’t have a ton of other archetypal options if your guild strategy isn’t panning out for you. I don’t want to get into a card-by-card breakdown of the set — there are far better Magic analysts writing on far more specialized sites if that’s what you need — but the general takeaway is this: the mechanics and themes presented in Gatecrash can break down or become abusive very quickly in the wrong environment. Extort is a fine mechanic in any two-player format, Limited or Constructed. However, in a multiplayer environment like Commander, Planechase, or Two-Headed Giant, the accelerated effect of hitting multiple opponents makes the mechanic exceptionally powerful exceptionally fast. This is not to say it shouldn’t be allowed, just that players need to be aware of how strong it is when a single mana can consistently and repeatedly gain two or more life for a player. Conversely, the Simic Evolve mechanic tends to stall out and stagnate if you don’t get exactly the right subset of cards in your pool. It’s a mechanic built to exploit sequencing your plays in a very structured order. Unfortunately, Limited environments give you the least possible control over your access to that structured order. Without a consistent way to keep climbing the ladder of base creature sizes, or to put the counters you accrue to another use, your evolvers will typically gain one or two counters and then peter out. Take all of this with a grain of salt; Gatecrash can absolutely be played in a Limited environment or multi-player formats, and I encourage you to try it. However, if you’re looking for a genuinely dynamic set for a draft, there are better choices — Innistrad or Innistrad/Dark Ascension for example. 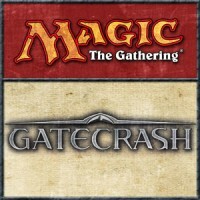 Add a Review for "Magic: The Gathering – Gatecrash"